I have here a very colorful cake for my entry! This is Iya's christening chocolate cake from Red Ribbon last May 1. 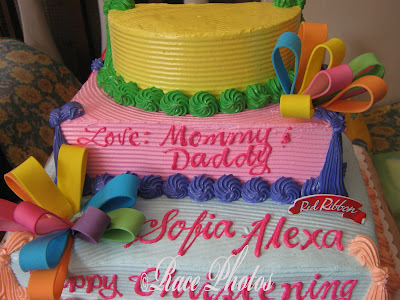 The three-layered cake composed of yellow, pink and blue cake with different colors of ribbon - you can see yellow, pink, green, violet, orange and blue. The icing on the pink layer is also blue. What about red? Dedications and greetings are written in red writings! All in all this cake is almost a rainbow cake with pretty trimmings and design. It's not only enticing to the eyes as the cake is yummy too! It's a pity that Iya is not old enough to have a slice of this cake :-). Maybe she'll be able to eat some cakes on her first birthday, I'm sure she'll love it! 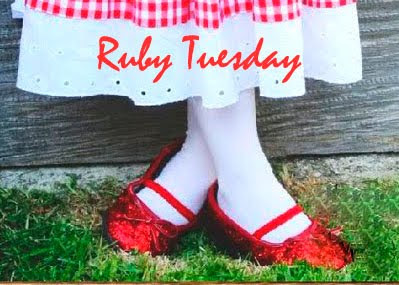 For blue & mellow yellow monday and red tuesday pics pls click on the badge at the top!